I have been building clavichords and harpsichords since 1977. Using traditional materials and methods, I am known for instruments of rich character and 'color,' and for attention to details of touch and reliability. I work alone, which allows me to focus all my energy and passion on each instrument. It is very important, I believe, that I am a player myself. All of my instruments receive a proper playing-in, and I expect them to satisfy my own demands as a player before I send them out into the world. In addition, two major Baroque orchestras, Boston Baroque, under the direction of Martin Pearlman, and the Portland Baroque Orchestra, under various musical directors including Ton Koopman and Monica Huggett, have used privately-owned instruments of mine as their primary ensemble harpsichords for nearly two decades. Several of Boston Baroque's recent CD's, including at least two earning Grammy nominations, were recorded using my instrument. Ultimately the instruments must speak for themselves, and there is no substitute for experiencing them in person. I always maintain a concert-ready instrument on which I perform, and I welcome visits to my home and shop. Since 1996 I have exhibited my harpsichords and clavichords at the Berkeley Festival and Exhibition and the Boston Early Music Festival. 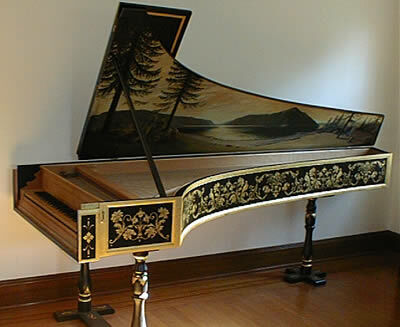 The instruments are available to play, and there are typically mini-recitals each day, including performances by harpsichordists who have recorded for Wildboar Recordings.